Uptime and response time are among the most important factors in determining the quality of a web host. To monitor these we usually have to pay. But while searching for uptime monitoring tools, I came across a website called webhostingsworld.com. 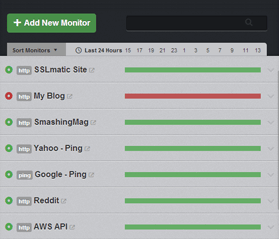 It looks like they monitor Siteground with a free tool called Uptime Robot. So I decided to check it out and it really works like a charm. You can up to 50 monitors for free. They check every five minutes if the monitored website is up and the response time it gives. They even have an easy to use API. Other uptime monitoring services charge quite a lot. While of course, if you only want to monitor a website for a certain time period, you can do it for 30 days for free with the most popular service too provided by Pingdom. However, if you want to keep monitoring over a long time period, which I highly recommend becuase that’s how you can get more precise data, then I would recommend UptimeRobot for sure.